The Wenger Micro Tool Chest Watchmaker's Knife could also find a place in the pocket of any technician who works with precision parts. Although the tool set is designed specifically for work on watches, the scale of the tools could fit the world of micro-electronics as well. If you collect unusual knives, you'll certainly be interested in this one. The 3.5-inch-long pocket folder holds twelve different tools with 19 possible applications. Nine of the tools are sized for micro-tech functions. 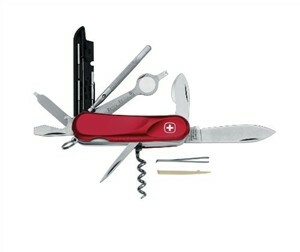 Only a few of the multi-function blades are included in other Wenger Swiss Army multi-tools. You'll recognize items like the corkscrew, bottle opener, awl, and knife blade, but beyond the familiar basics it's a new tool set completely. There's a blade for opening the back of a watch's case, a mineral crystal magnifying lens for focusing on tiny problems, a spring lifter and wire bender, and a set of miniature pin punches. The basic high carbon stainless steel knife blade's 2.5-inch plain edge solves all sorts of ordinary problems, and the large combination bottle opener and flat blade screwdriver locks in place for tougher jobs. You'll also find the indispensable tweezers and plastic toothpick in this technician's knife, and you're certain to need them. Wenger's ergonomic handle design prevents slips and sits comfortable in the hand, but one of the main advantages is that the streamlined grip simply looks good. The micro tool chest from Wenger fits the pocket neatly, and the stainless steel key ring allows users to rig a wrist loop for extra security. For a more rugged multi-tool designed for the average user, see the Wenger Evo-Grip.